New Media Rights is proud to share our client Bad Rap Inc.’s film Bad Rap: Salima Koroma and Jaeki Cho’s debut documentary. The film follows four Asian American rappers as they struggle to find their place within the mainstream music industry that doesn’t know how to categorize them except through stereotypes. Bad Rap uses its subjects as jumping off point to show the history of Asian American representation in both hip-hop and broader pop-culture. To do this, several decades worth of music, movie, and TV clips needed to be included to provide viewers necessary context. Clearing clips in music documentaries, in general, is difficult, but documentaries about hip-hop create additional hurdles because of the liberal use of sampling and remixing in the art itself. For example, one artist may rap over another producer’s beat which is itself sampled from one or several other previous musicians. California Western School of Law students Bryan Blanco and Samantha Lopez led by their supervising attorney Shaun Spalding took the lead on reviewing the film’s rough cut to determine whether uncleared clips rose to the level of fair use. New Media Rights worked with the filmmakers throughout the editing process and analyzed over 100 clips suggesting edits when necessary to bolster fair use arguments and recommending cuts when needed. New Media Rights worked with Salima, the film’s director/editor to revise the film and get the documentary to its final theatrical version balancing the need to adhere to fair use while preserving the intent filmmaker’s vision. “Our tiny team reached out to New Media Rights for guidance on an independent music film we were finishing up. We are first time filmmakers and it was my first film as a director and editor. Our documentary had music to clear, logos to get releases for, and music samples to search for. We weren’t sure what could be argued as fair use and what probably couldn’t. We had so much media, we didn’t know what to do with it. NMR went through all of our film’s assets and gave legal counsel about each piece of content in our film. In the end, NMR wrote an opinion letter to the film’s insurance provider for Errors & Omissions insurance. This is a necessary component for any documentary looking for distribution that relies on fair use to gain E&O coverage. The film is truly a passion project for Salima and Jaeki who originally met through their taste in K-Pop artist G-Dragon. 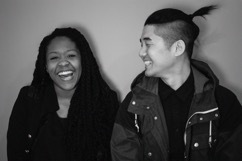 Originally a forty-minute project, the two created an Indiegogo campaign for Bad Rap and were able to exceed their goal from the many supporters who saw their vision. NMR is extremely happy to have been able to work on this project. We feel like we're a part of the vast team of supporters that helped make Bad Rap happen. Bad Rap screened at the 2016 Tribeca Film Festival and is currently getting ready for nationwide distribution. For more information visit Bad Rap or view the trailer.